The lithium ion battery is the prominent battery type used in the electric vehicles. They are preferred over other types of electric vehicle batteries as they have low weight, longer life span, rapid charging, fire resistant, and high energy density. Lithium ion batteries despite having high energy density have less weight, it can provide voltage, power, and energy with relatively light and small source. Also, using the lighter battery decreases the overall weight of the vehicle and hence increasing the efficiency of the vehicle. Along with this, ongoing research in the field of lithium ion batteries to enhance its range and will allow electric vehicle to have longer range. It is projected that lithium ion batteries will continue to lead the Electric Vehicle Battery market and will grow at a CAGR of 9.4% in terms of value during the forecast period. The demand for other type of batteries such as lead acid and nickel hydride battery are growing at a slow pace as compared with lithium ion battery and it is projected that the combine market size of all other battery types will reach more than US$ 13 Bn by 2027 in the electric vehicle battery market. In the global electric vehicle market, hybrid electric vehicle (HEV) segment holds more than 70% of the share in 2017. The dominance of HEV over PHEV and BEV in the electric vehicle market makes them the prominent market for electric vehicle battery. Hybrid electric vehicles are preferred more as its twin powered engine, comprises of IC engine and electric motor which decreases fuel consumption. Insufficient charging stations and vulnerability of solo battery vehicles have slowed the market for PHEVs and BEVs. It is estimated that hybrid electric vehicle will remain the most lucrative segment in terms of both value and volume over the forecast period in the electric vehicle battery market. Passenger car is the most attractive segment by vehicle type in the electric vehicle battery market owing to their relatively high market value share and growth rate, it is estimated to remain the most lucrative segment in terms of both value and volume over the forecast period. The passenger car segment is estimated to grow at a significant CAGR of 9% in the electric vehicle battery market during the forecast period. The competitive landscape section of the electric vehicle battery market delivers the most insightful information regarding the key market players, their relative global position and business strategies. In addition, a comprehensive view of the product portfolios, recent innovation and business expansion strategy adopted by key market players in the electric vehicle battery market is provided. The manufacturers in electric vehicle battery market to expand with strategic developments including product launches, expansion, and acquisitions in electric vehicle battery market. For instance, In April 2017, Panasonic Corporation established a new facility in Dalian, China for the manufacturing of automotive lithium-ion battery. In September 2017, LG Chem Ltd. invested US$387 Mn for setting up new manufacturing plant in Poland, Europe. This plant will manufacture EV Battery for automotive applications. In January 2017, Samsung SDI Co. Ltd. launched its innovative battery which have a fast charging capabilities with high energy density which enables electric vehicle to drive 600 Km. Some of the key players operating in electric vehicle battery market Automotive Energy Supply Corporation, Panasonic Corporation, BYD Company Limited, GS Yuasa Corporation, LG Chem Ltd., Samsung SDI Co., Ltd, Tesla Motors, Inc., Hitachi Chemical Company, Ltd., Narada Power Source Co. Ltd., Johnson Controls International Plc., Tianneng Power International Co., Ltd., Crown Battery Corporation, Furukawa Electric Co., Ltd., EnerSys, Wanxiang Group Corporation, East Penn Manufacturing Co., Toshiba Corporation, and Leoch International Technology Ltd. among others. FMI published an exclusive forecast report for the Electric Vehicle Battery market between 2017 and 2027. The foremost objective of this report on Electric Vehicle Battery market is to pitch spearhead insights on market scenario, demand generators, and technological advancements in Electric Vehicle Battery market. Also, the study on Electric Vehicle Battery market addresses key dynamics, which are expected to diversify the sales and future prominence of Electric Vehicle Battery market. The report on Electric Vehicle Battery market initiates with an executive overview in which a product definition is provided. The report further proceeds with taxonomy of Electric Vehicle Battery market elaborating on the key segments. Also, the report outlines visionary insights on dynamics of Electric Vehicle Battery market including drivers, restraints, opportunities and trends value chain analysis and pricing analysis. Value chain analysis and pricing analysis of Electric Vehicle Battery market have also been included in the report to help the readers to clearly understand the product framework map in Electric Vehicle Battery market. The Electric Vehicle Battery market has been analyzed with respect to segments such as battery capacity, battery type, vehicle technology, vehicle type, and region. The battery capacity in the report for Electric Vehicle Battery market include less than 20 kWh, 21-40 kWh, and more than 41 kWh. By vehicle technology, it includes HEV, PHEV, and BEV. Electric Vehicle Battery market register demand from vehicle types such as passenger car, light commercial vehicle, heavy commercial vehicle, and others. Battery type involved in the Electric Vehicle Battery market include includes lithium ion, lead acid, nickel hydride, and other battery types. The Electric Vehicle Battery market has been evaluated across primary regions such as North America, Latin America, Western Europe, Eastern Europe, Japan, Asia Pacific Excluding Japan (APEJ), and Middle East and Africa (MEA). Why sales of electric Lithium Ion electric vehicle battery are outpacing other types of electric vehicle battery? How many units of less than 20 kWh electric vehicle battery will be sold by 2027-end? Which vehicle type will hold largest volume share of the electric vehicle battery market? By what rate is hybrid electric vehicle battery sale is growing during the forecast period? What will be the growth rate of electric vehicle battery market in APEJ? The report offers an in-depth assessment on the electric vehicle battery market, which is based on a tested & proven research methodology, which involves comprehensive primary and secondary research approaches. These research methods have helped in arriving at important numbers for the electric vehicle battery market. Data collected on the electric vehicle battery market by these researches go through several validation funnels, examination and re-examination, prior to their inclusion in the report. Credibility of the statistics evaluated and data acquired on the electric vehicle battery market, bases itself on unique nature of FMI’s research methodology, which claims ensuring greater accuracy and provision of authentic data. Intelligence obtained from opinion leaders and industry experts in the electric vehicle battery market have been extrapolated, meanwhile contemplation of the data has allowed analysts to develop this analytic and insightful report on the electric vehicle battery market. FMI offers a 10-year forecast for the electric vehicle battery market between 2017 and 2027. In terms of value, the market is expected to register a CAGR of 8.5%during the forecast period (2017–2027). The main objective of the report is to offer insights on the advancements in the global electric vehicle battery market. The study provides market dynamics that are expected to influence the current environment and future status of the electric vehicle battery over the forecast period. The primary objective of this report is to offer updates on trends, drivers, restraints, value forecasts and opportunities for manufacturers operating in the electric vehicle battery market. A section of the report discusses how the overall competition in the market is steadily increasing. It discusses various factors that are shaping the internal as well as external competition in the market. The electric vehicle battery market is expected to grow at a stable pace in the near future. Moreover, steady growth of the automotive industry due to an increase in the vehicle production & sales and the rising demand for eco-friendly vehicles are among factors estimated to create healthy growth opportunities in the electric vehicle battery market. The report provides a detailed market share analysis of the electric vehicle battery on the basis of key manufacturers. A section of the report highlights the country-wise electric vehicle battery market. It provides a market outlook for 2017–2027 and sets the forecast within the context of the report. The report sheds light on key developments and activities executed by prominent manufacturers operating in the electric vehicle battery market. A detailed analysis has been provided for every segment in terms of market size (volume and value) analysis for the electric vehicle battery market. 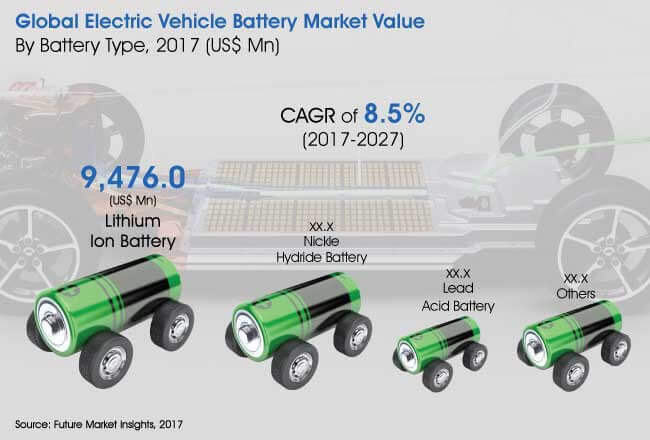 The report starts with the market overview and provides a market definition and analysis about drivers, restraints, opportunities, supply chain analysis and key trends in the electric vehicle battery market. The next section includes the global market analysis, analysis by battery capacity, vehicle type, vehicle technology, battery type and regional-level analysis. All the above sections evaluate the market on the basis of various factors affecting the market and cover the present scenario as well as future prospects. For market data analysis, the report provides historical data from 2012 to 2016 and considers 2016 as the base year, with electric vehicle battery market numbers estimated for 2017 and forecasts made for 2018–2027. It is imperative to note that in an ever-fluctuating global economy, we not only conduct forecasts in terms of CAGR, but also analyse the same on the basis of key parameters, such as year-on-year (Y-o-Y) growth, to understand the predictability of the market and to identify the right opportunities for market players. Another key feature of the electric vehicle battery market report is the analysis of all key segments in terms of absolute dollar opportunity. This is usually overlooked while forecasting the market. However, the absolute dollar opportunity is critical in assessing the level of opportunity that a provider can look to achieve as well as in identifying the potential resources from a sales and delivery perspective in the electric vehicle battery market. The report titled “Electric Vehicle Battery Market” focuses on providing information regarding the volume and value of the market from a global perspective. The research on the said market was initiated thorough secondary research on the product, using both top-down and bottom-up approaches, right down to the country and segmental level. Electric vehicle production & sales, market trends and growth projections were taken into consideration to arrive at the total market value. In addition to the above secondary research, the yearly revenue generated by the various types of electric vehicle batteries was estimated. Furthermore, the yearly revenue generated from the electric vehicle battery manufacturing companies from each product type were obtained from primary as well as secondary sources and then benchmarked at the regional level. Fluctuations in the annual prices over the forecast period are based on the historic market trends and expected percentage change in the upcoming years on the basis of investments on the patent market and the related industry. Any decline or increase in the prices in the upcoming years is kept linear for all the regions. The electric vehicle battery market value thus deduced was once again cross-verified and validated from the supply side. FMI’s proprietary regression analysis forecast model has been adopted to generate the market estimation for the forecast years and takes into account the effects of macro-economic factors impacting the overall electric vehicle battery market and was further validated by the primary respondents belonging to different levels across the entire value chain of the electric vehicle battery market, which include manufacturers and independent service providers. In the final section of the report, a competitive landscape has been included to provide report audiences a dashboard view. Detailed profiles of manufacturers have also been included within the scope of the report to evaluate their long- and short-term strategies, key offerings and recent developments in the electric vehicle battery. Some of the key players in the global electric vehicle battery market are Automotive Energy Supply Corporation; Panasonic Corporation; BYD Company Limited; GS Yuasa Corporation; LG Chem Ltd.; Samsung SDI Co., Ltd.; Tesla Motors, Inc.; Hitachi Chemical Company, Ltd.; Narada Power Source Co. Ltd.; Johnson Controls International Plc. ; Tianneng Power International Co., Ltd.; Crown Battery Corporation; Furukawa Electric Co., Ltd.; EnerSys; Wanxiang Group Corporation; East Penn Manufacturing Co.; Toshiba Corporation and Leoch International Technology Ltd., among others. Narada Power Source Co. Ltd.
Tianneng Power International Co., Ltd.
Hoppecke Batterien GmbH & Co. KG. Coslight Technology International Group Co., Ltd.